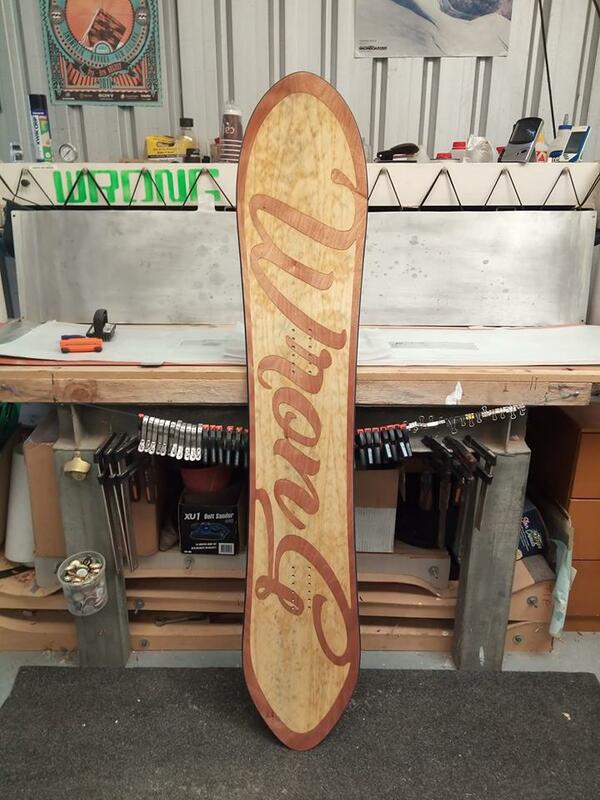 The finish looks really great Gav - what's your recipe on veneer? I use a 3 coat wet epoxy on wet epoxy. I then polish it using various grades of wet and dry. I get an absolute mirror finish. I tend to make skis, and the problem I have is that they chip very badly - any views? Yeah veneer durability isn't as good as the plastic type topsheets. I have found a couple of ways to improve it a bit. I mix up about 50 grams of resin and then thin it right down with about 10% ( so 5 grams) of acetone and then brush it into the veneer. Work it in so it soaks right through it. Can add more acetone if you need it to soak through more. I then put it in my press and press it flat with light pressure and normal epoxy cure heat. When you pull it from the press leave it in the cassette to cool, otherwise it will curl right up out of shape. You can let it cool in the press if you want. You will end up with a much tougher veneer that is nice and flat and really easy to work with. If you are finding the epoxy topcoat is chipping you are using an epoxy that is too hard or the coat is too thick maybe. What resin do you use? It's not West System is it? Boat resin is usually really hard. Oh and i grind the sidewall with two angles. The first angle is the normal angle then i add a nice sized 45 degree all around. The flatter angle around the top seems to protect the edge of the veneer a lot more. The topcoat on that latest board is a polyurethane clear coat. I've used epoxy and polyurethane. I prefer the polyurethane. 24Dave wrote: hey Gav, the red board looks great! Hey Dave I tried to message you but it won't go through. Is your inbox full? The drag racing board looks great! When you do the 2 sidewall angles are you doing the first with the router base running on the base of the board and the second running the router base along the top of the board to get the 45 chamfer all the way around the board, or just doing both with the router running on the base? I've started doing the first one at 7.5 degrees with the router running on the base and a top bearing trim bit then doing the next at 15 or 25 degrees the same way, but around the tip and tail you don't get a good bevel. 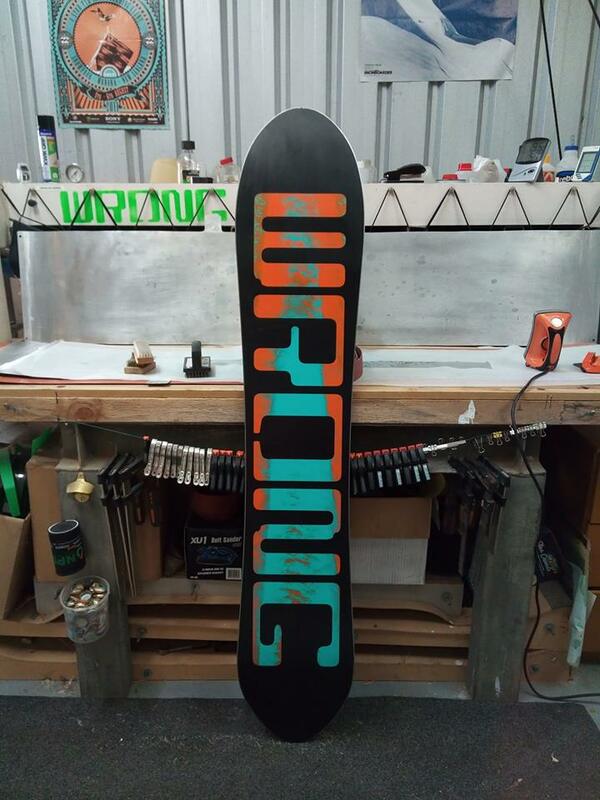 I've been thinking about using a bottom bearing 45 chamfer bit after the initial 7.5 or 15 degree full sidewall bevel and running the bottom bearing along the sidewall and the router on the top of the ski to get an even 45 bevel all the way along, but worried the contour of the top of the ski might make this difficult. It's hard to experiment at the last step because noone wants to stuff up a ski/board after all that work. To be honest dude I do it all by hand. I have some flap discs I fit to my 5 inch angle grinder and I do the whole job holding the grinder in one hand. I spent quite a bit of my time with a grinder in my hand cutting or shaping steel for work and it becomes quite normal to pick an angle and be able to get a pretty accurate finish all the way around. I do the whole sidewall at 20 degrees and then cut the top 1 third at about 40 degrees. Yeah the old slip with the router on the final sidewall pass is a fairly brutal moment to swallow. Finished off a couple of surf inspired Pintails. They both killed it in Japan last month. They are fairly soft flex compared to most boards I build for myself but it was fun to try something different. I kept a decent amount of torsional flex so that at least allowed a bit of grunt into the edges. I reversed the cut-outs on both the veneer topsheet and base P-tex. One is a 160cm board the other is only a 154cm. The shorter one is also a fair bit narrower, this is why the veneers look a little different around the edges, it's just the board dimensions. Both look amazing! Can you post more detailed specs? Chris, I'll get the specs when I get home from work on Monday. They are both mid-wide boards. Nothing crazy but a little extra float. Heaps of rocker in the nose and a short running length, I think the bigger one is still only a 900mm running length. The sidecut is fairly progressive and the width across the rear bindings is heaps more then across the front bindings. It helps it hold on in a carve on hard pack a little better than boards like this normally would. 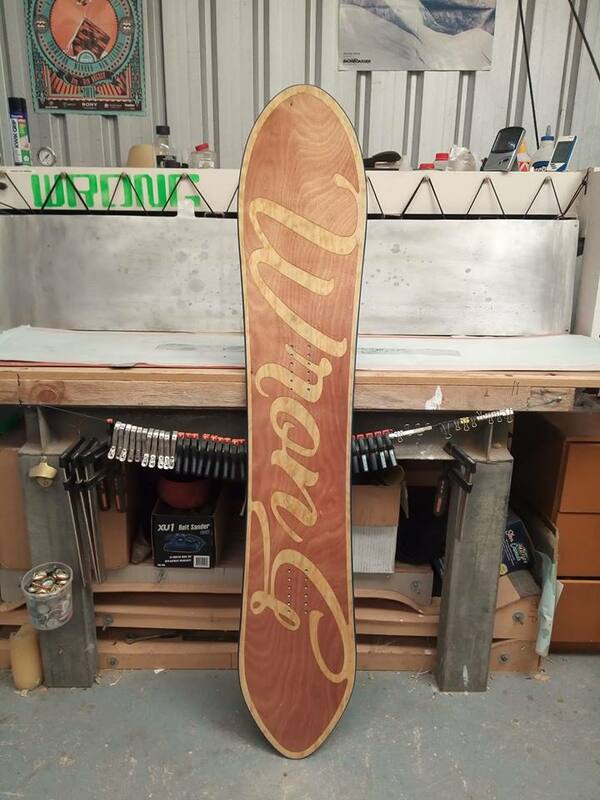 They don't carve as hard as my swallowtail boards do but they also aren't as stiff as most boards I build. The 160cm is only 2750 grams. I used only 450gsm biax (0, 90) glass top and bottom plus a carbon fiber 45/45 surf mat to add some extra torsional stiffness. 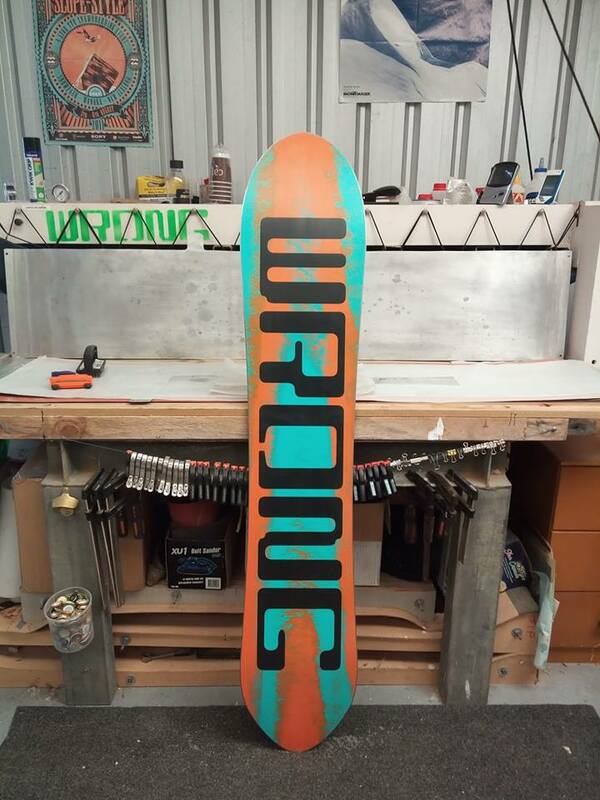 Its ended up a very interesting flex and something I will definitely use again if I want to make a softer board with just enough grunt to hold on if needed. The first board I put the carbon on the top but it came through the topsheet veneer a little so on the smaller board I put it under the core. I expected the carbon on the bottom would cause it to be even softer flex but was happily surprised to find that board to be a tiny bit stiffer. Not sure whats going on there, the cores were built slightly different though. Thanks for posting, I need a bit of motivation like this once in a while, in order to keep up my motivation to finish my press and get things working..